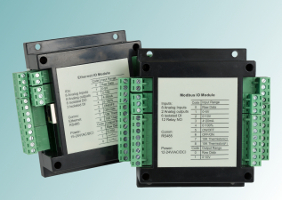 Proprietary I/O devices such as board-level products, I/O bricks, etc. 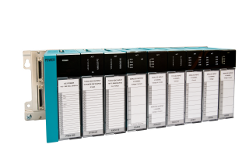 Tealware™ is a high density, modular I/O system, suitable for applications requiring as few as 16 digital and/or 4 analog points up through thousands of I/O points. The same I/O modules, adapters, and other equipment can be used regardless of application size or physical configuration. High speed local I/O and distributed/remote Ethernet I/O configurations are available. 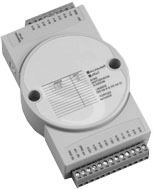 Tealware I/O can be used with any SoftPLC CPU, or with any other system that can drive ModbusTCP I/O. S Series I/O modules are a family of low cost, compact, networkable data acquisition and control modules, providing analog-to-digital, digital-to-analog, digital input/output, timer/counter and other functions. All S Series products are DIN rail mountable, and can be mounted side-by-side or stacked piggy-back atop each other for small physical space applications. Modules are available for both ModbusTCP ethernet and serial RS-485 networks. A Series I/O modules are a family of low cost, compact, networkable data acquisition and control modules, providing analog-to-digital, digital-to-analog, digital input/output, timer/counter and other functions. All A Series products are DIN rail mountable, and can be mounted side-by-side or stacked piggy-back atop each other for small physical space applications. Modules are available for both ModbusTCP ethernet and for serial RS-485 networks. Also provided in this product line are low cost unmanaged ethernet switches and media converters. We offer board-level I/O for our Smart, RTU and embedded controllers, as well as USB and Ethernet I/O that can be interfaced to computers or other vendor's controllers. As an open architecture system, SoftPLC PAC's can interface to I/O and I/O systems from hundreds of vendors. Serial/USB, Ethernet, industrial networks (eg: Profibus, DeviceNet, etc. ), and board-level products are some examples. We provide interfaces to industrial I/O networks which are factory installed into our PAC's for "out-of-the-box" ready systems.